Everyone’s favourite monster is back – live on stage in the West End, The Gruffalo is full of songs, laughs and scary fun for children of all ages. ‘Tall Stories’ magical, musical stage adaptation of The Gruffalo roars in to the West End for a monster season at the Lyric Theatre. Music, laughter, physical theatre and just the right touch of scary fun, makes Tall Stories The Gruffalo the must see family show for lovers of the timeless story and everyone looking for a smashing day out! Based on the award winning picture book by Julia Donaldson and Axel Scheffer this production continues to entertain audiences worldwide, bringing everyone’s favourite furry monster to life on stage. Voted the nation’s Number 1 bedtime story by BBC Radio 2 listeners. The Gruffalo is booking from 3 July 2019 until 8 September 2019 at the Lyric Theatre, London. Join Mouse on a daring adventure through the deep dark wood – in the search for hazelnuts – as she meets the cunning Fox, the eccentric old Owl and the party mad Snake, and outwits them all with the story of the fabled Gruffalo. Armed with only a nut map and a little courage Mouse must make sure she doesn’t end up as dinner for these wily woodland creatures. 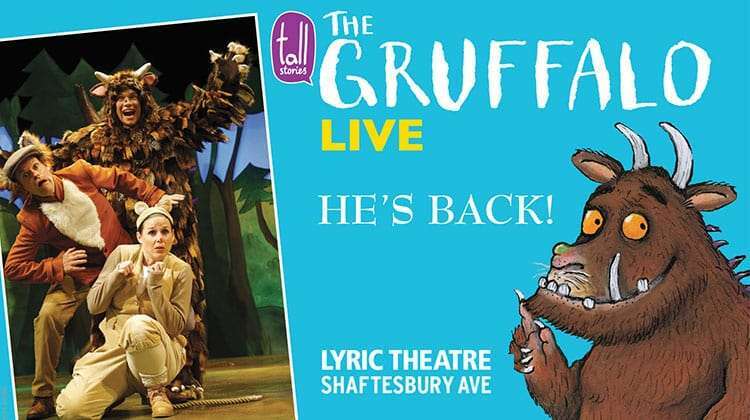 Buy The Gruffalo tickets at the Lyric Theatre by using the Search Box at the top of the page or by clicking the Buy Now button above. You will be purchasing tickets via our preferred ticketing partner Encore Tickets, who are a fully bonded and licensed ticketing company and members of STAR - the Society of Ticket Agents and Retailers. Encore offer real-time ticketing with confirmed seat locations at the time of booking so you know your seat numbers before you book your The Gruffalo tickets. Why book The Gruffalo tickets with us?